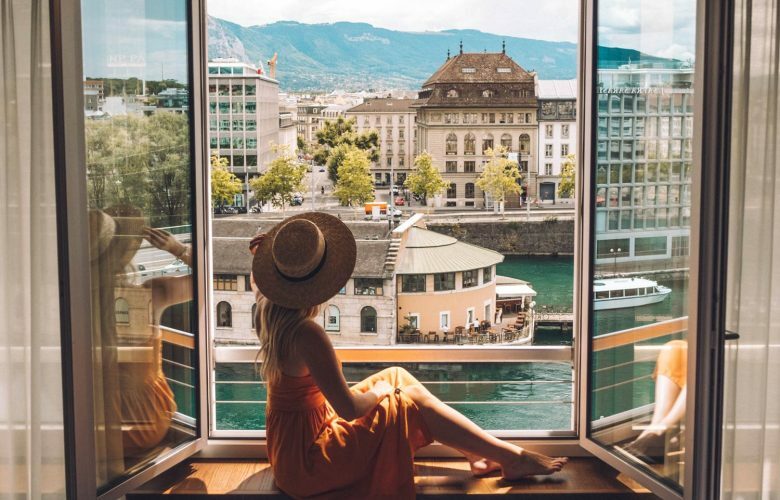 Between the drop-dead gorgeous mountain views and the Rhône river backdrops, it’s no wonder why people travel all over the world to go to Geneva. 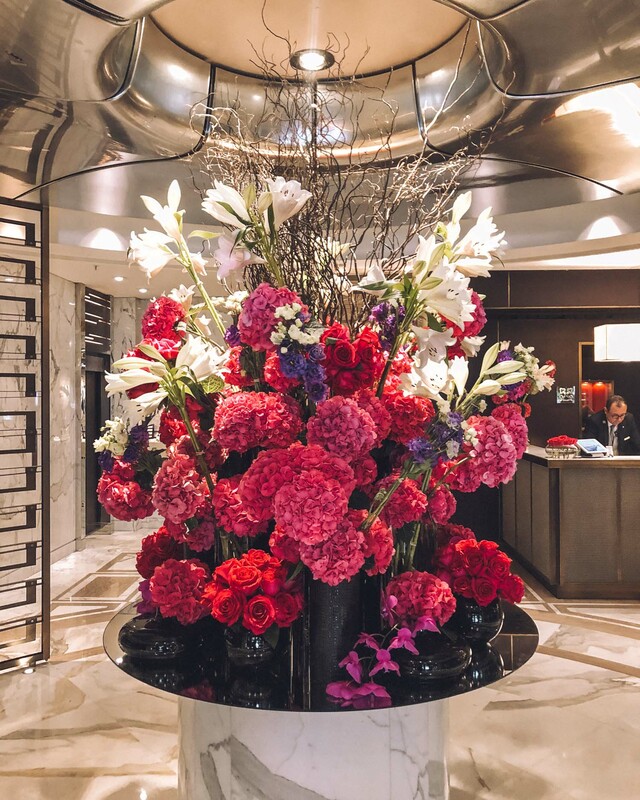 On my recent trip there, I stayed in the heart of the city at Mandarin Oriental Geneva. With access to the lakeshore, the jet d’eau, Parc de la Grange, and more, it’s the perfect spot to be immersed in the Swiss culture. 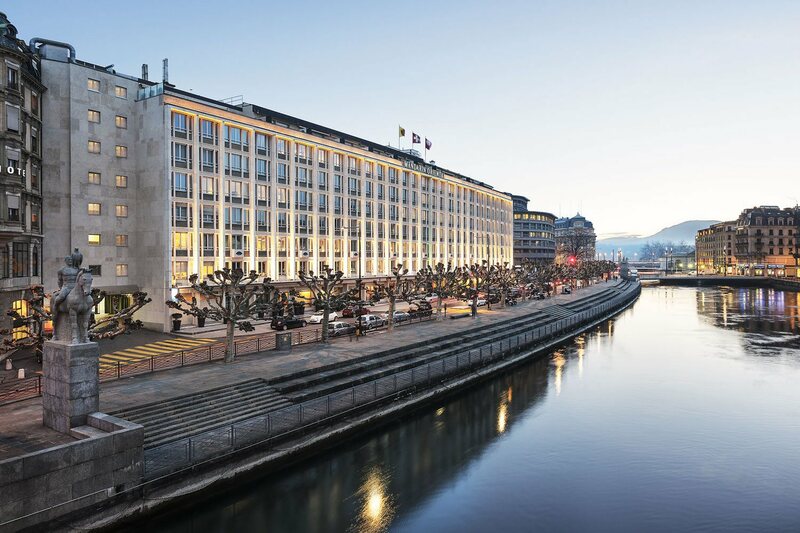 Here’s what it’s like staying at Mandarin Oriental Geneva in Switzerland! One of the easiest options is taking a taxi or uber directly to the hotel. However, you can also take the line 150 train into the city center which is about a 17-minute ride. Mandarin Oriental Geneva has a truly unique history. In fact, it was the first hotel built in Europe after the Second World War. Originally built in 1950, the luxury hotel offers 189 fully renovated elegant rooms, 27 which are suites. While you may never want to leave, the highlight of it all is it’s prime location 5 minutes away from Geneva’s historic Old Town, cultural, and touristic districts. If you’re looking to stay in, you can find a 24-hour fitness center, saunas, and a full-service beauty salon. During my stay, I checked into a Deluxe River View King Room. My room included a large seating area, a comfy sofa, a walk-in closet, a marble bathroom, and most importantly a view of the river. With its neutral hues and contemporary design, you’ll find yourself relaxed in no time. If you’re looking for something a bit more spacious, other suites include a fireplace, living rooms, a terrace, dining areas, a jacuzzi, and panoramic views. We’re talking up to 5400 square feet of space. All rooms include a flat-screen television, bold modern art, speakers for your music, and a Nespresso coffee bar. The staff has access to the mini-fridges from the hallway meaning they can restock your room without disturbing your vacation. If you’re looking to get dressed up and enjoy a fine-dining meal, Rasoi by Vineet, the first fine dining Indian restaurant in Geneva, is the perfect spot for you. The vibrant red and black decor compliments the contemporary Indian cuisine. If you’re unsure what to order, they’re known for grilled curry leaf-ginger lobster. 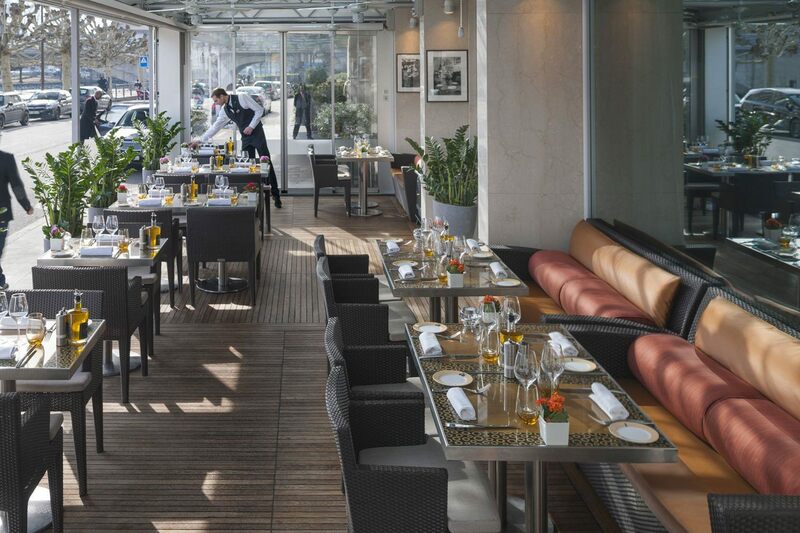 For a faster-paced meal or Sunday brunch, be sure to stop by Café Calla. Their French-inspired menu includes things like salads, ceviche, pasta, land and sea plates, along with a wide variety of wines from their 1500-bottle cellar. If you’re not a wine person, order the Mandaritini, a cocktail with vodka, cranberry juice, fresh raspberries, and mint leaves. 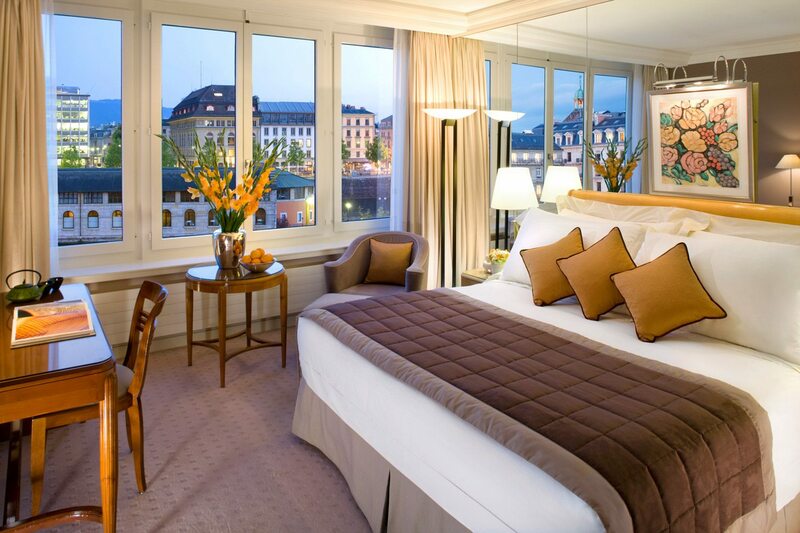 Mandarin Oriental Geneva is truly luxurious. 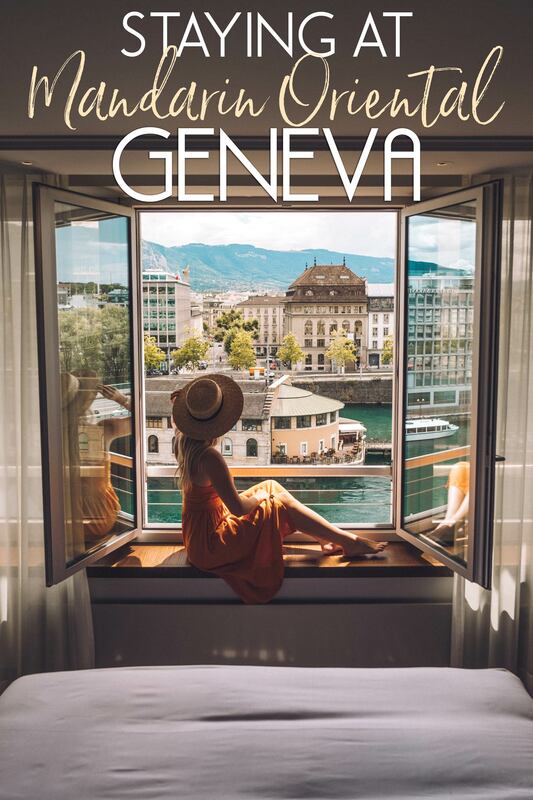 With its ideal location in the heart of the city, views of the rivers, and delectable food, it’s the perfect place to call home while visiting Geneva.